Let’s talk customer acquisition strategy. One fundamental way to grow your business is to win new customers. Sounds simple enough, right? After all, there are so many channels and so many ways for today’s businesses to find, engage with, and attract potential new customers. The most challenging part: where exactly — and how. After all, you don’t want to waste your time and money on the wrong channel or customer acquisition strategy. As anyone who has ever looked to scale their business will tell you, one of the most difficult things to do as far as ways to acquire new customers is narrowing down your choices. So what are some of the lowest-cost, highest-ROI ways to win new customers? Read on as we share 5 cost-effective strategies for customer acquisition. Organic local SEO (search engine optimization) is a low-cost strategy that will help your business gain visibility in the eyes of potential new customers. If you’re running a business with multiple business locations, then you can even try to rank for specific geographical areas that you’re targeting. This is where location pages come in. When done right, location pages can be a powerful SEO machine and high-ROI customer acquisition strategy. Think of them as micro-sites or silos containing locally optimized content for each of your business locations. And all are linked to your main website. The idea is to map out all of the locations in which you are targeting new customers, then build out unique, discoverable landing pages for each. Choose your URLs wisely. Keep it simple and make it effective. Let’s say your website URL is terracegrill.com. A sample recommended URL for your location pages is terracegrill.com/cityname (ex: terracegrill.com/chicago). Add your NAP. NAP stands for your business Name, Address, and Phone number. This should be present on each of your location pages and correspond to each individual business location. Publish unique local content. Besides your NAP, your location pages should also include unique, relevant local content, like store descriptions, operating hours, local news, deals and promotions, online reviews of the location, and even information about the team. Online reviews can make or break your business. 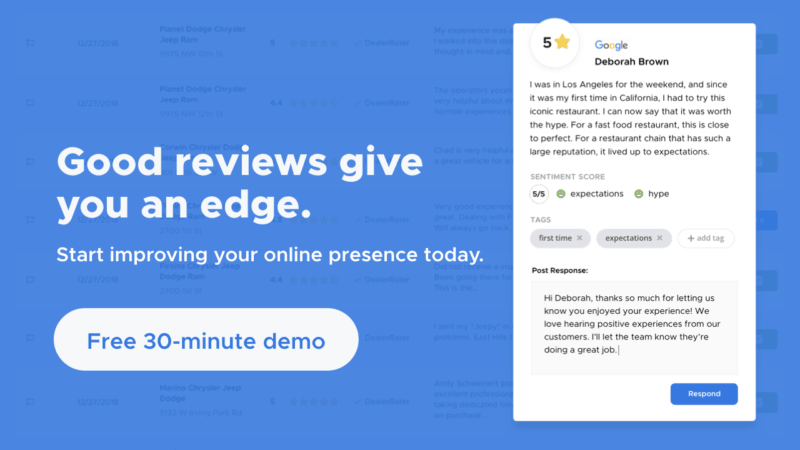 In the age of Yelp and TripAdvisor, reviews impact search engine performance, shape your brand reputation, and affect your ability to win new customers. This makes it critical for your business to manage and respond to online reviews as part of your customer acquisition strategy. Apart from responding to reviewers, you can also take advantage of the 5-star ratings that you already have. Share your best reviews on social media. Add them to your website. Celebrate or call out those who consider themselves as your biggest fans. This will help you build powerful social proof that will inspire shopper confidence and attract more people to your business. Another low-cost, high-ROI customer acquisition strategy is to approach bloggers, social media influencers, and opinion leaders and engage with them so that they can talk about your product or service in front of their audience. Once you have built a strong relationship with these people, then you can begin to develop and execute your influencer campaign. For example, if you’re marketing a restaurant, you can reach out to foodies on Instagram who have a growing community of fans and followers. You can invite them to dinner, send them samples of menu items, give them custom discount links or codes that they can share, ask them to create sponsored posts, or even take over your Instagram account for a day. By building relationships with influencers, you can turn them into brand ambassadors and, through their own communities, expand your audience reach and attract more potential new customers. If you have the ability to identify who your happiest customers are, a good customer acquisition strategy is to create a customer referral program. This incentivizes your happiest customers to refer their friends and family. Just like with influencer campaigns, you can create personalized discount links or codes for your customers to share with their own networks. Remember: when you make customers happy, they will want to share their experience with their friends and family. A customer referral program is a great way to leverage that and really empower your promoters to introduce and advocate your business to others. As you may well know, Quora is a question-and-answer website and a place for people to share knowledge and contribute unique insights on literally any topic you can think of. It can also be a low-cost, high-ROI platform for acquiring new customers. A growing number of savvy business owners and marketers are using Quora to drive traffic to their site. The idea is to funnel traffic through to your website content (like a blog post or landing page) by answering questions posted on the Q&A site.